CSE had the pleasure of attending and exhibiting at the 2014 Cantech Conference in Toronto on January 16th. This is the first such show from Cambridge House International who have traditionally organized mining conferences including the Vancouver and World Resource Investment Conferences. We had the opportunity to attend several talks including a panel titled “Do the Public Markets Still Matter to Canadian Tech?” (ed. yes they do! ), a wonderful speech by Sir Terry Matthews, a rousing presentation by Difference Capital’s Mike Wekerle and Neil Johnson (Why Tech is Back), and the day’s highlight – a keynote address from former Canadian astronaut Chris Hadfield. Many great ideas and observations were presented, including some lively debate over the viability of crowdfunding for tech companies during one of the panels. LX Ventures CEO Mike Edwards offered a lot of support for the model as a means to introduce risk capital into tech startups as there is still a funding void for series A financings in Canada. Accredited investor rules are also making it hard for risk seeking investors to get into the ground floor of tech investment opportunities and crowdfunding could help participation here according to Mr. Edwards. 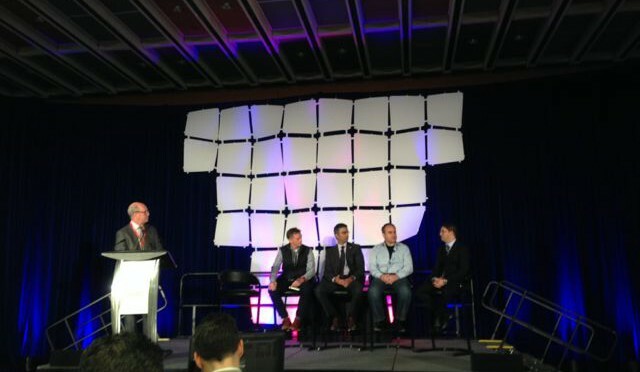 On the same panel, it was acknowledged that the “sweet spot” for tech financings in Canada is settling between five to 25 million dollars with companies of a certain size still needing to list on a US exchange when they hit $100 million in revenue – a stat provide by John Ruffolo (OMERS Ventures). There were many indications that the street has tuned onto tech after successful IPOs last year, with Halogen Softwares, Inc. being one of the examples presented as an indication of what to expect in 2014. There was discussion around lessons learned from the late nineties tech bubble. Most VCs and bankers are looking to avoid the mistakes of the past by applying more diligence toward their capital investments. Many of the investors echoed each other when describing their “must-haves” from prospective investee companies including: credible, experienced management that are addressing real market demands with products that have established traction (customers, sales – not interested in funding R&D). No “paper napkin” deals this time around! Regarding companies in the R&D stage the time has never been better to leverage government programs as espoused by Sir Terry Matthews who himself uses these programs aggressively. In his own words he said that the country is undergoing the biggest tech refresh in the history of Canada. Based on attendance, quality of participants, and thoughts shared on stage (and in the exhibit hall) there was an obvious sentiment that technology plays are going to be a greater focus for Bay Street investment firms, and in some cases, like Difference Capital, it is the sole focus of their investment business. Both sir Terry Matthews and Chris Hadfield reminded the audience to not discredit or undersell Canadian ingenuity and technical talent – one point made in the public markets panel reminded us that there are a lot of homegrown companies that need to be nurtured and supported by our institutions if we are to have greater ambitions globally! It was a wonderful day and CSE would like to extend its congratulations to Cambridge House and to our prize draw winner Carly Bennie (from Difference Capital) who walked away with a Samsung Galaxy Tab 3! We are excited at the prospects of another show of this caliber in Vancouver and next year in Toronto.